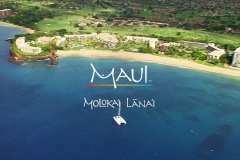 Lanai is Hawaii’s smallest inhabited island, and groups here are treated to an intimate, private island-like experience that’s big on amenities and adventure but still feels like a place of retreat. The lure is luxury, but Lanai's off-the-beaten-path persona adds to the allure. Few roads are paved, and there is not a single traffic light to be found. Lanai is calm and composed, which is exactly how your attendees will feel during their stay. The tennis courts, a world-renowned golf course, horseback riding, and unique UTV rides make for memorable activity, complemented by high-end restaurants and the heavenly serenity of a spa. This 141-square-mile island once enveloped by pineapple plantations and with a population of just a few thousand, is now a haven for hiking and mountain biking and off-roading by jeep, by which attendees can explore ancient historic sites and remnants of bygone villages. Naturally formed boulder sculptures linked to Hawaiian legends at Keahiakawelo (Garden of the Gods) and a sunken vessel at Kaiolohia (Shipwreck Beach) are must-sees, as is the two-mile pristine shoreline of secluded Polihua Beach. Plantation-era buildings set the scene in Lanai City, the center of activity on “The Pineapple Isle.” But as with the rest of the island, the atmosphere is casual and low-key. The six-block stretch of shops, art galleries and eateries runs alongside Dole Park, a green space shaded by stately Cook pines, and is the town's cultural heritage center memorializes the island’s ranching and plantation past.